Closing a meeting is a like closing on a new home. The closing date means you’ve successfully accomplished a home search and survived the lending process. It also means the moving process is just beginning and the real action is about to commence. Similarly, closing a meeting is a celebration of accomplishments and establishing next steps. In a previous post, I covered the importance of planning in successful meetings. How they open and close, however, sets the tone as well as the pace of resulting action. Here are steps to take in a proper meeting close for valuable action. Get in a habit of reviewing accomplishments at the end of each meeting. Make sure to plan for this important step. If objectives are not met, use this time to discuss the approach to anything unachieved. These items can turn into assignments or be moved to a future meeting. Whatever next steps are chosen by the group should be outlined and agreed upon. Meeting objectives and outcomes that were reached should be listed and celebrated. 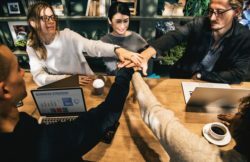 In a Harvard Business Review article entitled “The Right Way to End a Meeting,” Paul Axtell suggests that reflecting on the value of accomplishments is “one of the most powerful acknowledgment and appreciation tools.” People feel empowered when they know their work and time were worthwhile. End your meetings reminding participants of a job well done. In longer meetings or multi-day conferences, it is beneficial to review accomplishments at the end of each major session as well as the end of each day. Even mini-achievements should be celebrated. The more you affirm success, the more momentum you’ll create. People often discuss their feelings about meetings afterward, so why do we make them so taboo as a part of meetings? What we’re feeling in every situation affects what we’ll eventually be doing. Staff leaving frustrated, unappreciated or overwhelmed are probably going to share with others and this reduces momentum. On the other hand, people feeling accomplished, energized, and engaged will be ready to act. That’s why it’s important to get a sense for how people are feeling at the end of each meeting. In small groups, it’s easy to just ask how people are feeling about what was accomplished. Give each person time to say a few words and make it safe to express thoughts honestly. The success of the meeting will become obvious quickly. Break larger gatherings into groups of 6-8 people and do the same as above. 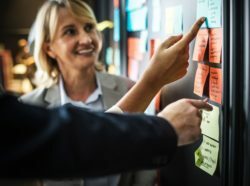 Where the objective of a meeting is education related, consider the option of having participants post a word or short phrase on a sticky note and attach it to some central location. Let people verbally share within their group for a few moments and then post thoughts on a board to leave up for all to review as they are moving about or taking breaks. When I did this at a recent meeting I noticed at least half of the attendees stopped to read what others had posted. There are creative ways to conduct this process in smaller groups, just make sure you do it. Getting these feelings out in the open means meeting leaders can address potential problems immediately; if the general tone is negative or later, with a few individuals who seemed discouraged. Successful meetings will end with positive descriptions. Bonds are more concrete when feelings are shared among team members and colleagues. Getting participants to commit to an action in public means they’re more likely to follow through. Even if tasks aren’t assigned to every individual, there are actions that can be taken to promote growth. Supervisors can commit to telling staff about meeting accomplishments. Participants might realize they need to be better prepared for future meetings and decide to do that. The action could be as simple as reviewing meeting notes for further clarity and understanding. Regardless of what the action is, ask people to claim it. The simplest way to gain commitment is to have participants fill in the blank; based on what I learned at today, I will [fill in the blank]. Depending on size, groups can be broken up. They can report to each other in small roundtables and then assign group leads to report back to the larger group. This process assures that everyone speaks and shares in the responsibility of meeting success and follow-through. Ending a meeting on time is a requirement of all successful meetings. That means the agenda must account for the time required for a closing activity. Accomplishment review should only take a few minutes unless you need time to discuss any unfinished business or decide what to do with a missed agenda item. The participant closing statements require 15-20 minutes with small groups to be done properly. If you’ve broken larger meetings into smaller groups, then you’ll need the small group time plus an additional 5 minutes per table if group leaders are reporting back. Estimating time for agenda items takes practice and planning. If your meetings consistently run over, people will dread coming. This problem can be corrected by making sure high priority items are discussed first and always estimating more than the time you first think necessary. Review agenda items to verify they require discussion rather than simply informing. Finally, follow through on all start and end times during breaks. When you give attendees a 15-minute break, let them know you will start the session back up on time and then do it. Respect everyone’s time and your participants will respect you for it. “If you want anything to happen you must follow up, follow up and follow up” Axcel states in another article entitled, “Two Things to Do After Every Meeting.” This is a habit I wish I’d formed earlier in my career. It may have created a larger email inbox but I believe the time is ultimately saved in the resulting clarity of action. The follow-up email is another opportunity to review accomplishments, provide meeting notes, send resources, acknowledge and remind attendees of their commitments. It’s also an opportunity for meeting leaders to admit any flaws in the process and either suggest future meeting improvements or ask for additional feedback. When possible, keep emails short and put meeting notes in a separate document to include as an attachment. Then the email text can focus on tasks and accomplishments to maintain momentum. Use bullet points or bolded headings so people can find items of interest quickly, should the email get drowned in a sea of other communications. Recently, I had the pleasure of conducting a facilitation training with an outdoor industry group. Due to group size and educational nature (rather than strategy or issue related) of the session, the closing piece was more about what participants would do in regard to personal learning. Therefore, public commitment to the group wasn’t necessary. After reviewing what was covered during the session, I asked participants for two things which they would write on sticky notes as well as share in small groups. First, I asked them to provide a word for how they were feeling about the session. Second, to describe what actions they would take as a result of the session. I was happy to see words like “energized” and “confident” to describe how they felt at the end of the session. There were a few words like “overwhelming” and that is to be expected – we covered a lot of ground. Overall, the feelings were positive. There were many action items listed. My favorites were those expressing the desire to share the information with supervisors and coworkers. That means the learning created excitement and validated the topics were useful. In a follow-up email, I provided an electronic copy of session materials, a few notes and a list of additional resources. I also apologized for a mistake and committed to a resolution. As a meeting facilitator, I continue to learn as well. Too often the vital step of closing is left out in an effort to save time. However, when meeting leaders don’t properly close by reviewing accomplishments, addressing feelings and committing to next actions, attendees usually leave feeling unresolved. Just like the excitement of closing on a home, make sure your meeting attendees leave feeling excited about their next step and motivated to act. Read Better Meetings Ahead for more on a successful meeting model. CONTACT ME for any of your meeting facilitation needs.